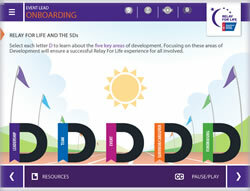 Weejee designed and developed 13 onboarding courses for American Cancer Society volunteers. These courses provide Relay For Life volunteers with interactive tools and training to support their passion and make a positive impact on fundraising. Topics include creating smart goals, building a team, and working the track. Badges make the learning fun and social sharing objects encourage learners to share their accomplishments with friends.